With X, her fourth album, Judith Jáuregui delves deep into the work of Russian composer Alexander Scriabin: a genius entrapped by delirium and ecstasy, one of arts’ most extravagant characters. 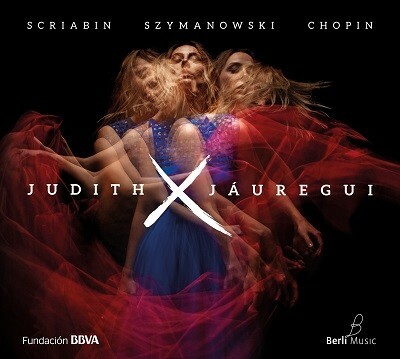 To frame his figure, Jáuregui has chosen to include in the album works by one of Scriabin’s great inspirations, Frédéric Chopin, and to reflect the mark that his visionary art left on the 20th century, specifically through the piano of the young Karol Szymanowski. The CD therefore reveals the common ground shared by these three composers, absolute references for any pianist. Scriabin wrote his famous Poem of Ecstasy between 1905 and 1908 when he was already steeped in the world of theosophy. Sonata no. 5, which is the starting point of X, is from that era and it links directly to the poem through a fragment included in the music sheet (“I call you to life, oh mysterious forces!” reads its first line). Together with this sonata, the Preludes Op. 15 and the Fantasy Op. 28 round off the works of Scriabin chosen for the album; and between these two we find Ballad no. 1 and Nocturne no. 20, Op. Posth. by Chopin, and the Preludes Op. 1 by Szymanowski.